Looks and feels like a shot glass, but it’s really a glass, mini measuring cup. It’s marked in teaspoons, tablespoons, ounces and milliliters, for measuring vanilla extract, milk and liqueurs. 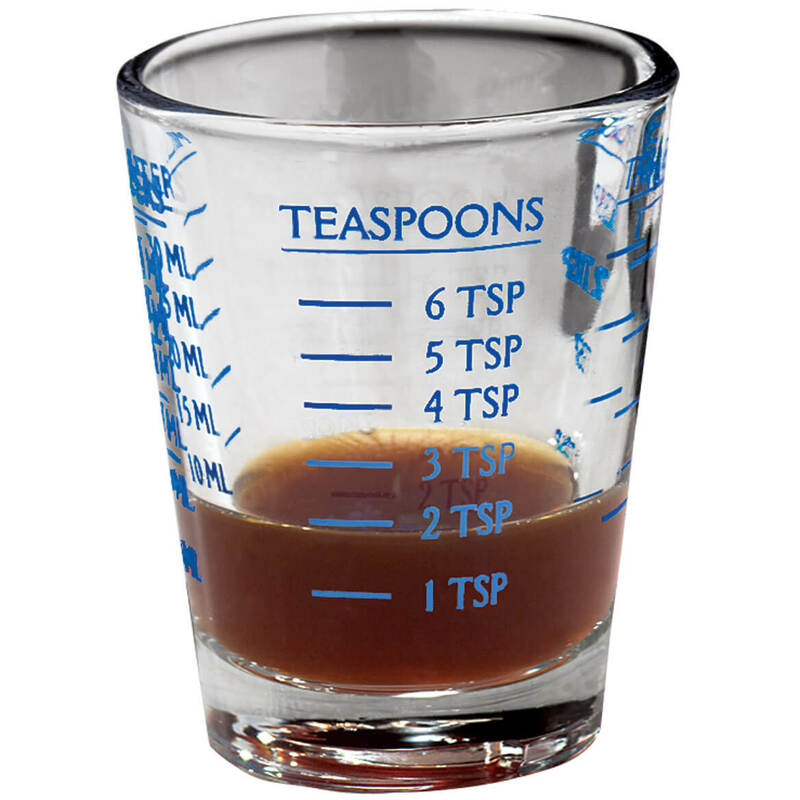 Liquid measuring cup maximum quantity: 1 oz. or 2 tbsp. The teaspoon measuring cup makes a wonderful stocking stuffer for good cooks. 2 3/8″ wide x 1 7/8″ high. 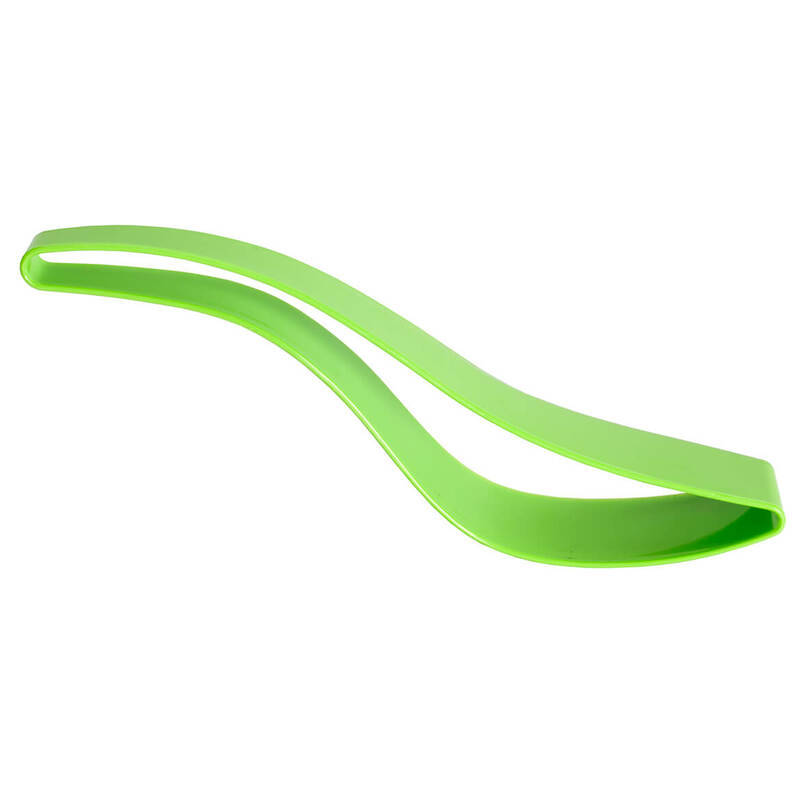 This flexible slice & serve cake squeeze makes it easy to slice and serve perfect cake every time—using just one hand! No need to touch cake or frosting, and no more plopping desserts sideways onto plates. Simply press the cake server into your cake, squeeze gently and lift—then lightly release your grip and set your perfect slice neatly onto plate. Great for serving cake at weddings, showers, birthday parties and church potlucks, it’s also perfect for everyday use or picnics (and safe for kids, since it’s designed without sharp blades). In green plastic; dishwasher safe. Cake cutter measures 10″ L x 2″ W.
Looking for the ideal gadget for measuring spices? These cleverly designed spice measuring spoons are narrow, so even the tablespoon will slip neatly into small spice containers. Our spice spoons are heavyweight, too, 18/8 stainless steel (much heavier than you’d expect), dishwasher safe, with 4″ long handles and at a great price. 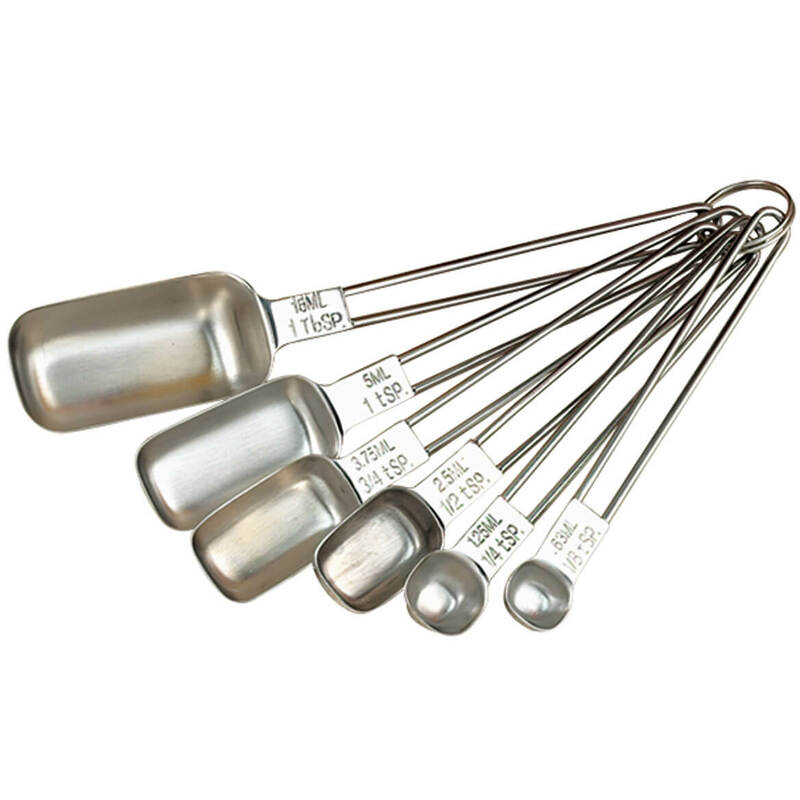 Set of stainless measuring spoons includes 1 tablespoon, 1 teaspoon, 3/4 teaspoon, 1/2 teaspoon, 1/4 teaspoon, 1/8 teaspoon. 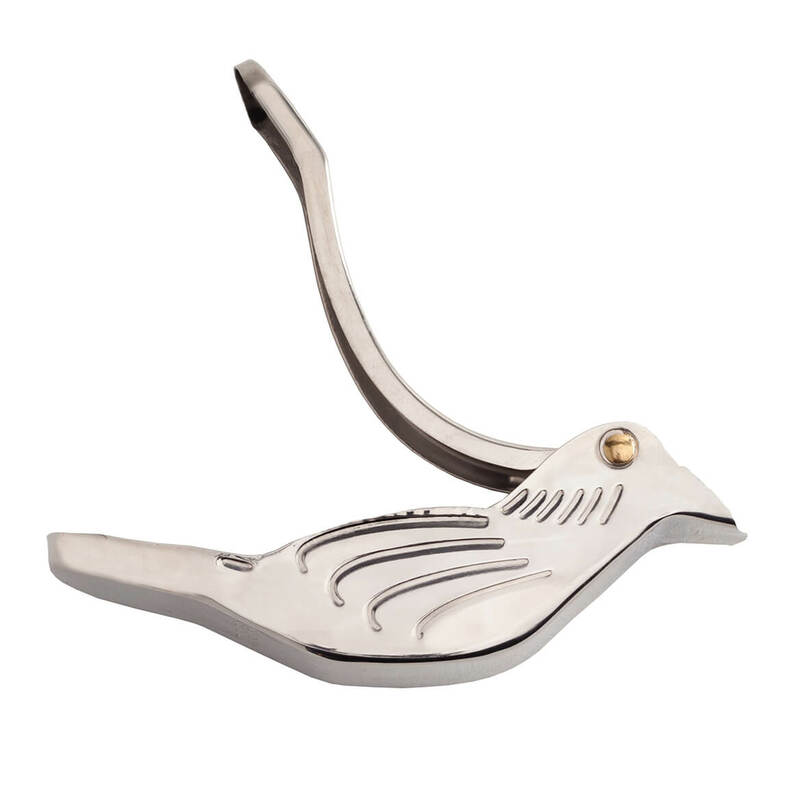 When you need a seedless spritz of fresh lemon or lime for veggies, fish or a glass of iced tea, a quick press from this stainless steel bird citrus juicer makes it easy! Simply place a slice of citrus in the citrus press—then squeeze and pour fresh, seedless juice from the little bird’s beak-like spout. 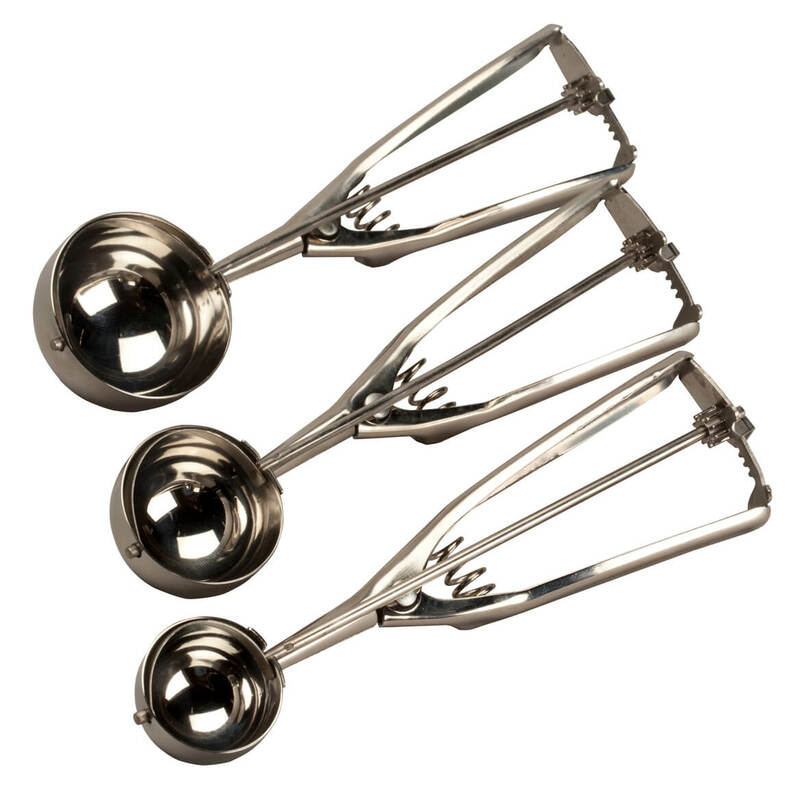 Citrus squeezer measures 4 1/2″ L x 1 1/2″ W x 3/4″ H. Hand wash.
Great for cookie dough and so much more, these stainless steel cookie scoops shape perfect, uniform portions in 3 different sizes. Releasing dough with the quick squeeze of a spring-loaded handle, they make it easy to form perfect round balls for cookie dough, meatballs, melon and more. Each metal scoop also works great for scooping heavy batter into muffin tins, and serve ice cream and sorbet with ease. Set of 3 cookie dough scoops includes small (1 1/2″ dia. ), medium (2″ dia.) and extra large (2 1/2″ dia.) scoops. Stainless steel; hand wash. 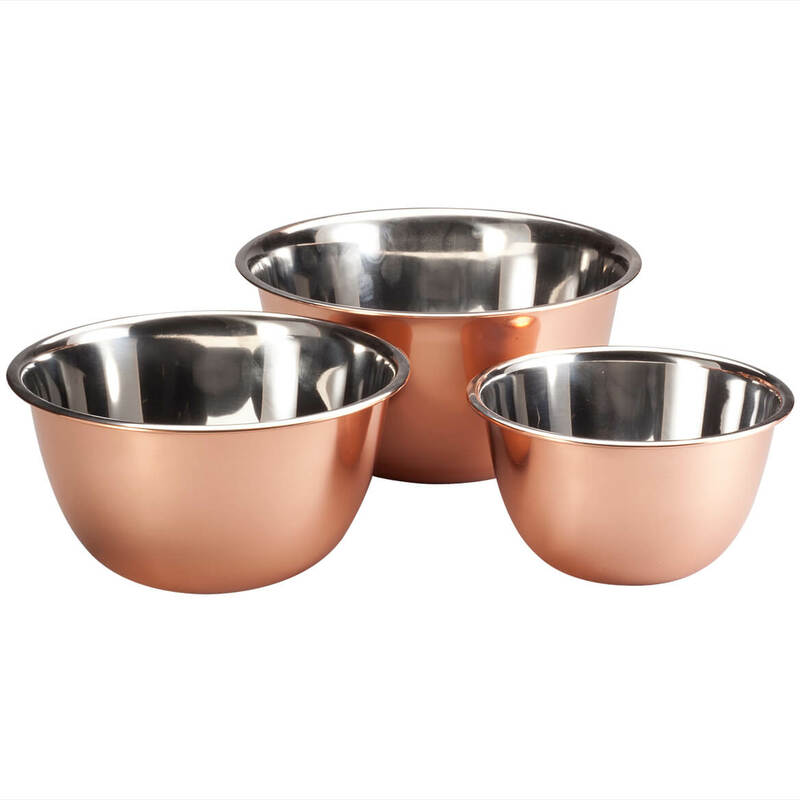 Mix cookie dough, whip cream or toss and serve salads in these elegant stainless steel copper mixing bowls. Designed in durable stainless steel with polished interiors and an attractive copper finish, the durable, yet lightweight copper bowls take on a variety of everyday tasks in style. 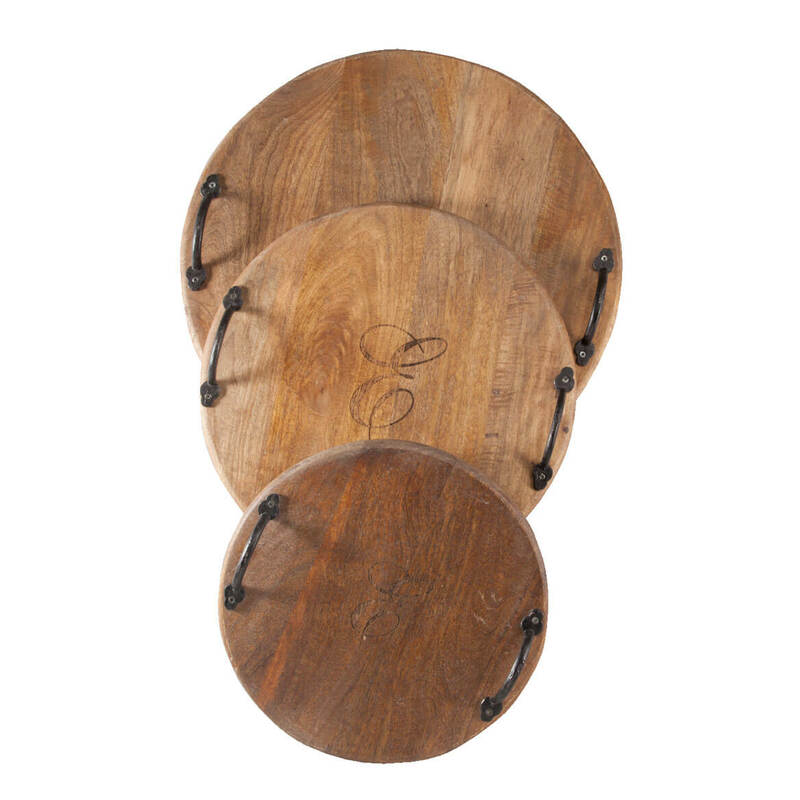 Rolled rims provide neat, drip-free pouring, and the trio nests together for space-saving storage. Freezer and dishwasher safe. Set of 3 metal mixing bowls includes 1.5-qt., 3-qt. and 5-qt. mixing bowls. Fitting conveniently over the sink, this Cuisinart cutting board with colander includes a removable, collapsible colander—letting you rinse and drain food as it’s chopped or trimmed. The 20″ plastic cutting board’s non-slip silicone edges rest securely over standard sized sinks, creating extra room for kitchen prep while conserving counter space. 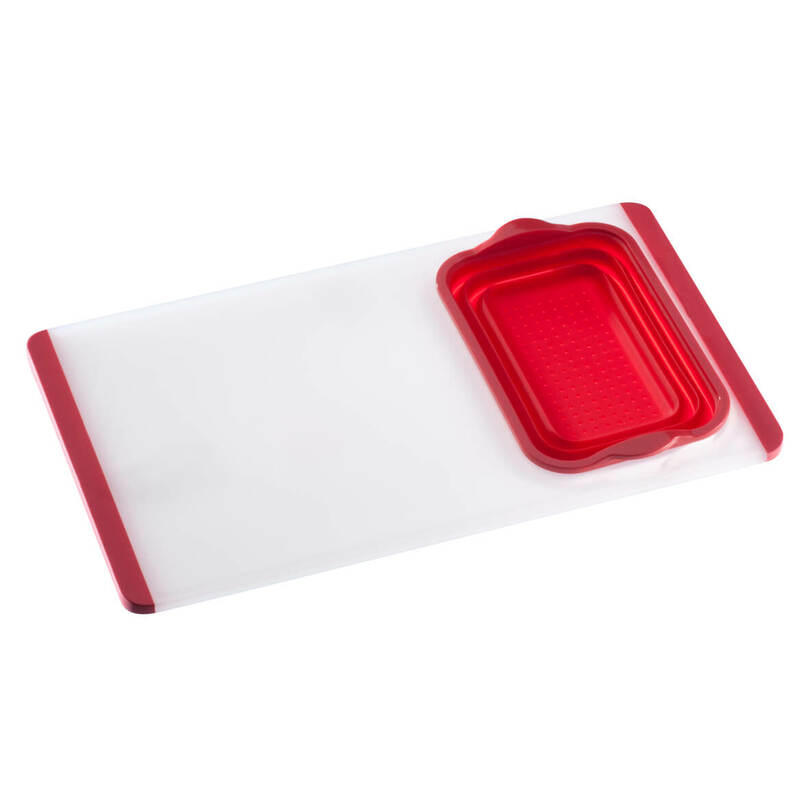 The red silicone colander insert prevents small foods from passing through, and the semi-transparent white polyboard is durable, easy to clean and dishwasher safe. This rustic wood and hand forged cutting board set is a rustic, unique take on traditional cutting boards. 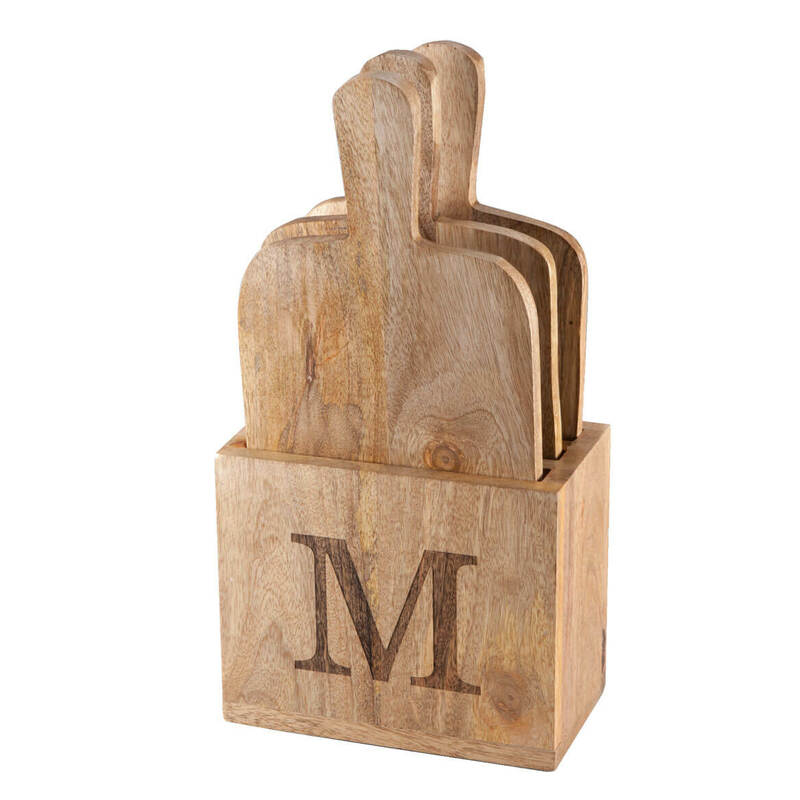 Crafted from solid wood with hand forged iron handles that give the boards a rough texture and appearance, each set comes with three different size cutting boards. This set offers excellent value and versatility, and makes a unique gift idea. Set of 3 custom cutting boards. Small measures 11″ diameter by 2” high. Medium measures 13″ diameter by 2” high. Large measures 16″ diameter by 2” high. Personalize with an engraved single initial. No returns on personalized items unless the item is damaged or defective. Please allow an additional 2 to 3 days for personalized items. 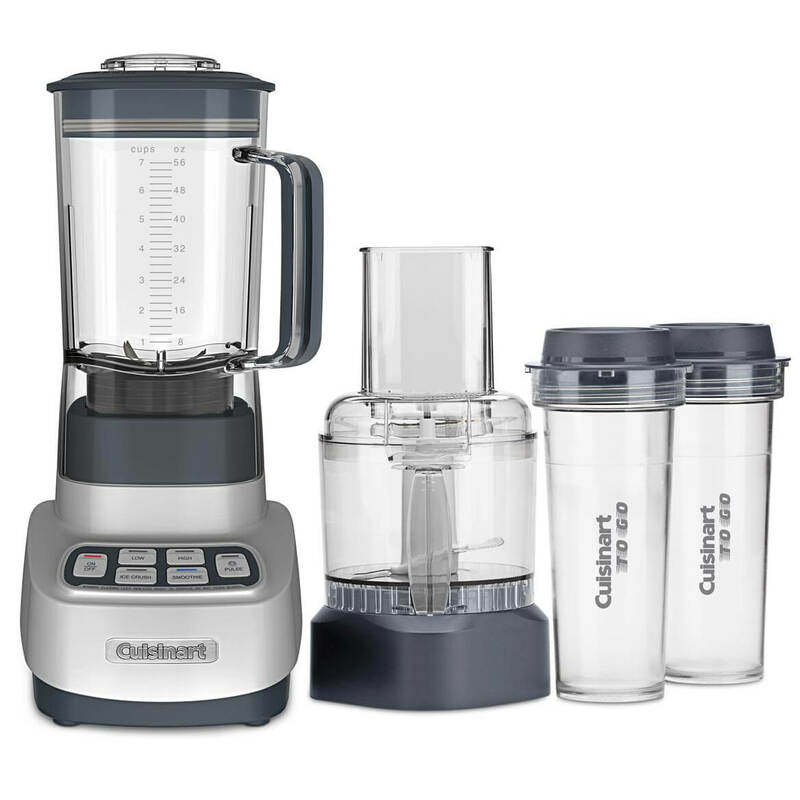 Cuisinart’s do-it-all blender/food processor includes 2 lidded travel cups, so you can take your creations to go! Featuring smart power and pre-programmed settings, the Cuisinart® Velocity Ultra Trio with travel cups minces delicate herbs, crushes ice and whips up healthy smoothies—right into its 16-oz. travel cups. Switch from 56-oz. food blender container to 3-cup food processor with feed tube and pusher to slice, shred, chop or mix. With stainless steel chopper blade, slicer/shredder disc, 1 horsepower motor and sturdy base, this workhorse can handle anything! BPA-free plastic; stainless steel. As any cooking aficionado knows, you can never have too many cutting boards. This cutting board gift set comes with three identical boards, so you’ll always have a clean board within easy reach. The custom cutting boards come in a rustic wood box, perfect for displaying on a counter or open shelf. Built-in handles make the boards easy to use. Makes a fantastic gift idea for anyone who loves to be in the kitchen. Set of 3 engraved cutting boards; each measures 7 1/4″ wide by 14” long. Personalize with a single initial. No returns on personalized items unless the item is damaged or defective. Please allow an additional 2 to 3 days for personalized items.